This definitely should be on your agenda if you are in the New York area. As Major League Baseball reaches the midseason All Star break, Congregation Or Zarua on Manhattan’s Upper East Side is fielding an All-Star lineup of Jewish major leaguers from several generations in its OZ Gallery. The public is invited to see the team OZ has assembled. Beginning in July the exhibit, “Major League Mensches: Jewish Stars of Baseball”, featuring historic, rarely-seen memorabilia from nine Jewish ballplayers – from the 19th century to last year’s World Series champions — will be on display in the OZ Gallery on Wednesday from 11 a.m. to 2 p.m. at Congregation Or Zarua. This display pays tribute to the contribution of Jewish athletes to America’s national pastime. Since the 19th century only 170 Jews have played in the major leagues. In the OZ Gallery exhibit, nine prominent Jewish players are being featured, along with colorful, classic memorabilia and related items. 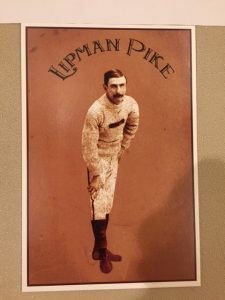 –Photos from Lipman Pike’s career. Pike (nicknamed the “Iron Batter,”), was the first professional Jewish baseball player. His career ran from 1871 to 1887. Also, one of the baseball bats in the exhibit, issued for the centennial of the iconic “Take Me Out to the Ballgame”, contains the song’s lyrics written by Jewish songwriter Albert Von Tilzer. — A 1929 team contract and a handwritten letter to his brother from Moe Berg, a catcher who played in the major leagues for 15 seasons. The letter relates Berg’s activities with the U.S. Office of Strategic Services (OSS) during World War II. Berg is perhaps now best remembered not for his play on the field but for his espionage work. The new film, “The Catcher Was a Spy,” based on a book of the same name about Moe Berg, is now in theatrical release and was recently screened at the JCC on Manhattan’s West Side. — The great lefthander Sandy Koufax is seen via his 1955 rookie baseball card, World Series tickets, a sew-on patch a figurine and numerous photos. A commemorative bat from Koufax’s induction to the Baseball Hall of Fame in Cooperstown, New York in 1972, signed by him and other inductees, will also be displayed. — A Louisville Slugger bat with a Jewish star carved into the knob used by Ron Blomberg, baseball’s first designated hitter. — A bobblehead doll and game-used bat of still-active player Alex Bregman, infielder for the Houston Astros, winner of the 2017 World Series. — Other athletes featured in the exhibit: Jimmie Reese, coach, infielder and onetime roommate of Babe Ruth; Al Rosen, Cleveland Indians infielder , nicknamed “The Hebrew Hammer,” and a former baseball executive; Shawn Green, home-run hitter, two-time All-Star, onetime New York Mets right fielder who later played and coached for the Israeli national baseball team in the 2013 World Baseball Classic. The items on display in “Major League Mensches” are on loan to Congregation Or Zarua from Jeff Aeder, a Chicago real estate developer, restaurateur, civic leader and philanthropist and the owner of the nation’s largest collection of Jewish baseball memorabilia. Aeder is the founder of the online Jewish Baseball Museum. The OZ Gallery at Congregation Or Zarua, at 127 E. 82nd Street, Manhattan mounts two exhibitions per year on themes of art and Jewish life and culture. Besides the Wednesday open house days, the Gallery may be visited by appointment. For details, contact Executive Director Helene Santo at HSanto@OrZarua.org. Congregation Or Zarua is a traditional, egalitarian and participatory Conservative synagogue located on the Upper East Side of Manhattan. Rabbi Scott Bolton is the congregation’s spiritual leader.